It’s actually called “The Stage” in the email reminders sent out (hence the capitalization). 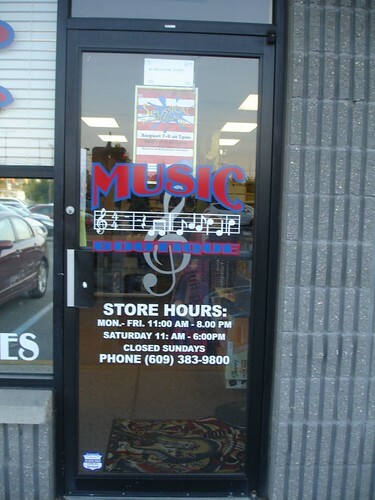 It’s neat that these guys thought of putting it in their music store, especially since this venue is much younger than the store itself. 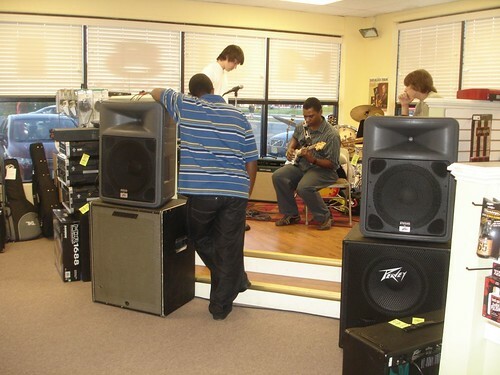 The first 45 minutes (starts at 7pm) of the open mic was a jam session by some of the guys that were there. It was, like I said, very loose — I ended up playing xylophone in the background! And bongos. To reiterate the point from the review: you’ll run into musicians. The manager is a musician. I was approached by two people looking to do some music projects. If that’s what you’re looking for, then by all means, go here. 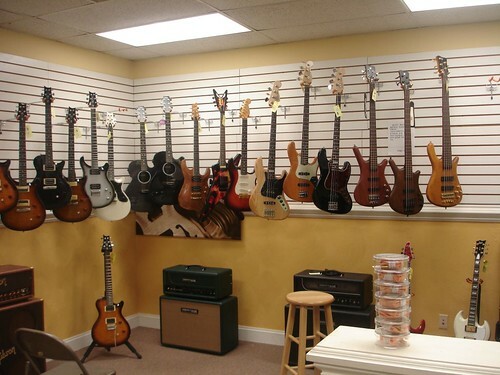 That’s it for pictures from the Music Boutique open mic in Northfield NJ on August 7th, 2009! 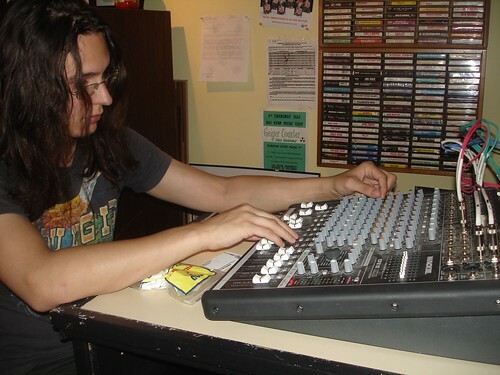 This is Alternative Soul’s infant cousin, the only living relative of the open mic family from Pratt’s Hill of Beans. 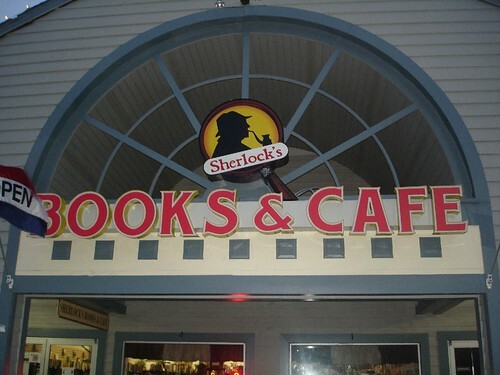 Sherlock’s Book and Cafe is the home to a lot of arts and music in the Smithville/Galloway area. It’s also the home of “Unrestricted“, Ray Tyler’s adult open mic. 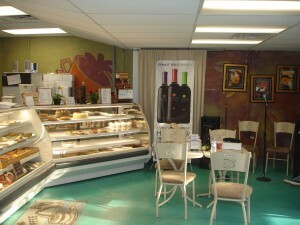 Some of you may be wondering, “What happened to ‘Alternative soul’ at Pratt’s Hill of Beans?“. It’s here at Sherlock’s Books and Cafe in Smithville/Galloway. Ray Tyler hosts this event, which starts at 8 and goes until 10pm. 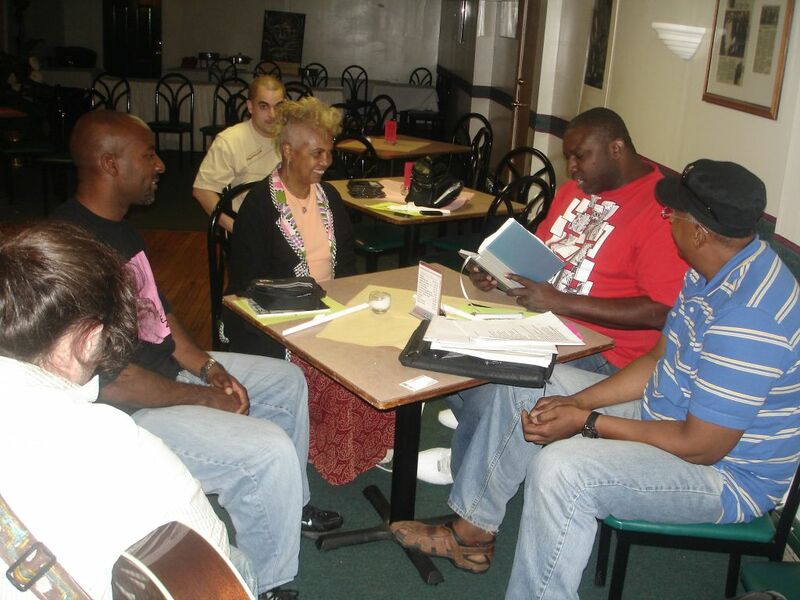 It’s a solid mix between singers and poets, and has some of the feel that “Alternative Soul” had at Pratt’s. There were gift card giveaways to newcomers and the talent was really good. Ray always starts off the night with some discussions and jokes, and some original poetry of his own. The crowd varies in age but from what I saw, it was anywhere from late teens to late 30s, and everyone had about 10 minutes to perform. It was a good night, and a great job on Ray’s part by keeping Alternative Soul alive. You can also download a print-friendly list of our open mics by going to our “List of Open Mics” page! 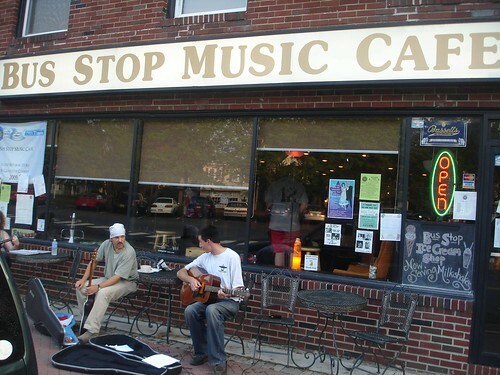 I went to Pitman to find out what the Bus Stop Music Cafe was all about. I was told it was great and boy was I told right. Every Tuesday starting at 7pm. The bares bones truth is that this open mic rocks. I say that fully knowing how cliche that sounds on an open mic blog, but that’s just the way it is. 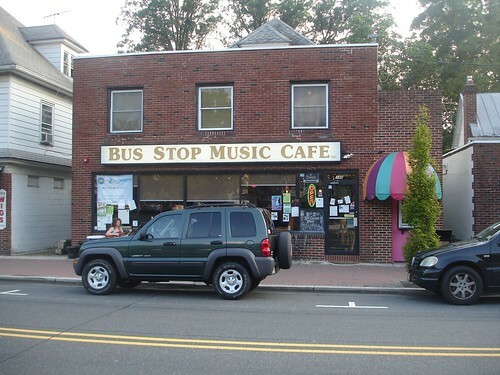 I highly recommend the Bus Stop Music Cafe. I place it in the same league as the Barrington Coffee House, which I reviewed earlier this year. There must be something about the area! And while this photo serves more as a testament to the event’s popularity, it also gives us a glimpse at the inside. The Bus Stop Music Cafe has the same kind of cool feel that Coffee.Comedy in Sea Isle City has, which is a very good thing. I’d like to also note that there were people of all ages, and everyone was very talented! Packed event – don’t worry about showing up to three people, because it’s a well known night. Cool environment – if the walls don’t make you play more soulfully, it’s your own fault. I should be getting paid for this kind of thing! 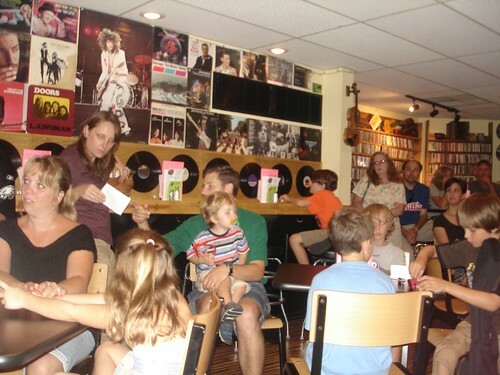 But seriously everybody, check out the Bus Stop Music Cafe on Tuesdays, it’s a great time. There were some newcomers like Steve & Katie, and Luke. Also, we got to hear a lot more from Passenger. Hopefully, we’ll hear a lot more from them very soon; they’ve got a great sound for such a new collaboration. Remember! 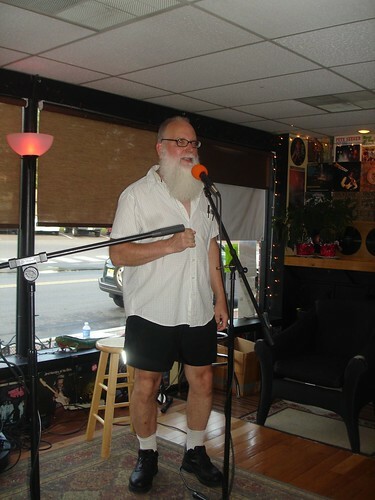 The Gregorio’s Market open mic is every 2nd and 4th Wednesday of the month!